I have been doing some research into family history as I am visiting my dear older brother. We have a fair amount of information on my mother's side of the family; Nazis came to their country in 1944, the "lucky" men ended up in slave battalions while the rest of the family was taken to Auschwitz. The matriarch of the family, Pearl "Penina" Klein of blessed memory was boarded into a cattle car along with her children, grandchildren and great grandchildren. Only one brother, Samuel Klein of blessed memory, came to America before the war. Our family comes from him. On my fathers' side less is known. They lived in a small village in Poland/Russia/Ukraine (depending upon the year) and the family line in Europe came to an abrupt end in 1943. My great grandfather came to America when things got tough around 1906. According to family history letters continued to flow back and forth until an abrupt end in 1943 after which no one was heard from again, ever. The Katz family in Europe came to an end. Today there are many who are trying to minimize the tragedy, or make it more "universal"; i.e. everyone suffered, and "there were good and bad in all nations, who is to judge". When I hear such things I become outraged. When one sees Holocaust videos on Youtube the antisemitic comments are sure to follow. Just scroll down and you will see comments that make any decent person want to explode in rage. The Denial is beyond belief. If we follow the logic of these people no one is really to blame. None of the local villagers in any of these countries has any blame or blood on their hands. The only ones to blame are "The Nazis" who are defined as a very small group of elite soldiers who have perished from history. Thus no one today need feel any guilt whatsoever. No one was to blame. Or as one elderly villager said, "Why is everyone getting all upset about a little feud between us and the Jews?" In today's political climate we are advised that it is best never to bring up such matters, leave it in the past where it belongs. But truth does matter. And truth does have value. I do not know how my family met their end. It is possible that they were dragged out of their homes and beaten and bludgeoned to death by German soldiers and Ukrainian neighbors. It is also possible that they were taken to the Belzec concentration camp and gassed. It is also possible that they were forced into a ghetto and later marched to a pit and collectively shot in April 1943. At this point there is no way for me to know. But this was my family. I will not go into too much personal history, that is private, but I will say that since my earliest years I have gone back in time to help these people, my people. I am with them all the time, sharing their fears and hopes. It is as if I have a special door that leads me to them when I close my eyes. Is it over? Is it in the past? No, it is not. In fact many of us are still trying to escape. We are the naked body in the death pit trying to pretend to be dead so we can escape later. We are the person pretending to be a gentile and "passing". We are the partisan in the forest, we are the hungry person in the ghetto building an underground bunker. We are the person on the death march running into the forest and hoping to find a place to hide or a villager who will give us a piece of bread. We are the sad and desperate and hungry face of a nightmare. And we are still trying to escape. Perhaps this is why my fate was to become a Krav Maga instructor, perhaps this is why I write and travel the world and teach others about what hatred can bring to the world. Did we escape? Whenever I see a Jewish doctor I feel, Oh no! This is not good, too many Jewish doctors is why the Germans hated us. And I recall one of our students on Tour and Train who told of an elderly German woman who "explained" to her that "You need to understand, what we did was necessary, the Jews were taking over our country. They controlled everything. We needed to defend ourselves"
The Hitler family doctor was a Jew. And he was so kind to them, when they had not enough money he did not charge them. At best he received a small fee. Adolf Hitler actually arranged to have this Jewish doctor smuggled out of Germany. How ironic! And Hitler's commanding officer in World War One was a Jew as well. And yet none of this had any impact on Hitler's world view. People today do not understand that we are not merely talking about some "past suffering" but about a national condition in which we are always on trial. No one really can escape and on one can really get over it, and this explains a great deal about Jewish political behavior and Liberalism around the world. I relate these lessons to our Krav Maga training. We are not just a collection of techniques, we are a system based on Jewish history and painful lessons. There is no therapy that will help you get over a tragedy and you can never erase the past. You must become like the State of Israel; rise up and dust yourself off, feel no self pity, expect no help from others. Become the Dried Bones that have come to life, let a new spirit enter you. Defy your own pain which will never be erased. No one forgets. Become a warrior, for life, for peace, for good. Your Krav Maga training is not only a collection of effective physical techniques, it is the spirit that will allow you to live with the trauma and face your greatest fears and enemies. It is our spirit; the spirit of an eternal nation. 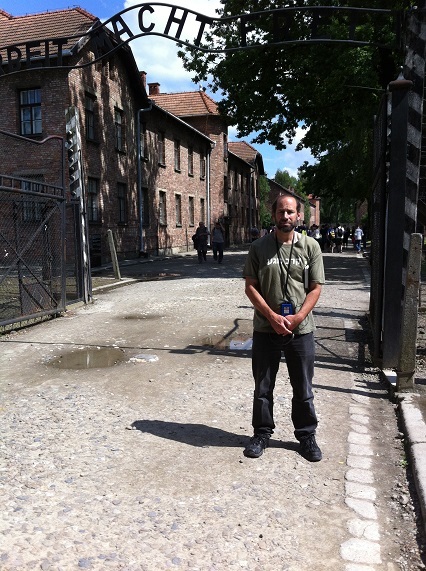 Arbeit macht frei, Moshe visiting Auschwitz. The sign was erected by the order of commandant Rudolf Höss. Did anyone really survive? How did my relatives feel when they walked in here?